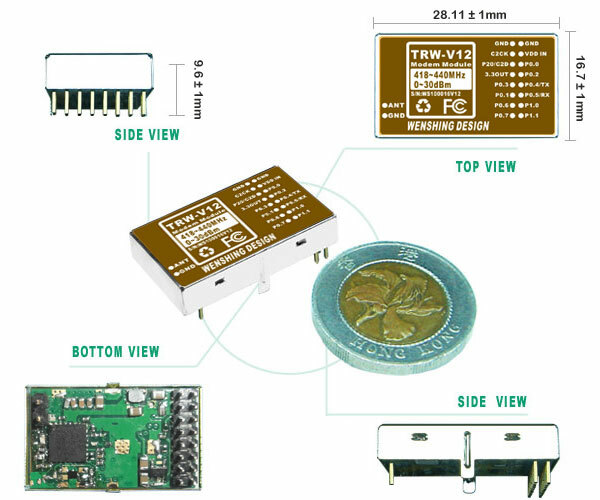 TRW-V12 is wireless high power data two-way transceiver RF module. T he key feature is its resistance against interference, which has more merit than traditional wireless module,Transmission distance of 1.5Km . The build in Saw Filter can remove unwanted interference signals. Furthermore, the transmission protocol can be used to forward signal and transmit to other required interface if the transit distance is not very far. This module is designed with fully digitalized structure. There is no need for further adjustment. This module has UR and I2C interface which not only provide convenient communication but also we can modify software to suit customers' needs which includes special detecting point for voltage (A/D), current, output voltage (D/A). It does not need MCU to make an End product; this will save user time for design. Another key feature- it can stay in wide room temperature, between -20 and +70℃. The build-in AFC can auto-lock frequency, there is no need to worry about the shifting frequency after long period of operation. TRW-V12 can be used on various applications: This module can vibration collector, (detecting landslides) and weather detection. There are other functions can choose from the list; also, software can be amended the overall makes module convenient and easy to use.